Iranian President Mahmoud Ahmadinejad said during a press conference in New York on Thursday "We love everyone in the world - Jews, Christians, Muslims, non-Muslims, non-Jews, non-Christians. "We are against ugly acts. We are against occupation, aggression, killings and displacing people - otherwise we have no problem with ordinary people. Everyone is respected. ... We declare this in a loud voice," he said. Ahmadinejad reiterated his stance that Iran has a right to develop nuclear technology for peaceful purposes and said he is "at a loss" about what more he can do to provide guarantees. "The bottom line is we do not need a bomb," he said. "We believe those negotiations are moving on the right path. Hopefully others will not disrupt the work - in small ways perhaps. We think it is a constructive path to take," he said. Responding to a UN Security Council demand that Iran suspend uranium enrichment, which can produce fuel for power stations or bombs, he said Tehran was prepared to discuss such a move but gave no time-frame for doing so. "We have said that under fair conditions and just conditions we will negotiate about it," the president said without indicating a timetable for such talks. 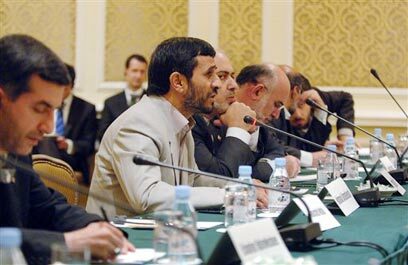 On Wednesday Ahmadinejad met senior US government officials at the Council on Foreign Relations in New York; the top American officials present at the meeting, some of them members of the George Bush senior administration, left with the feeling that a confrontation with Iran is inevitable. The meeting was held despite staunch opposition from US government officials and Jewish community leaders. Among those present were former National Security Advisor Brent Scowcroft and former ambassador to Israel Martin Indyk. During the meeting the Iranian president again expressed doubt over the Holocaust’s existence. “I believe more unbiased research should be carried out on the subject,” he said, despite the presence of business mogul and Holocaust survivor Morris Greenberg. Indyk told Ahmadinejad that Iran is doing everything in its power to stifle Israeli-Palestinian peace efforts. According to Ahmadinejad, the first ‘mistake’ refers to ‘the fact that the Palestinians are paying for an event they had nothing to do with (World War Two). “Sixty million people were killed during the war, why place so much emphasis on such a small portion of them,” Ahmadinejad said. He refused to state the number of Jews killed in the Holocaust, saying the figure should be checked. See all talkbacks "Ahmadinejad: I’m not anti-Semitic"